"Han" has enjoyed a nice show career in his younger years. His first point was obtained under Mrs. John Patterson where he went Best of Breed, and then continued on to a Group 3 under Denny Kodner. Since that time he accumulated a few nice wins, with the most noteworthy being a 3 pt. major in tough Florida competition on the 1997 January Florida Circuit. 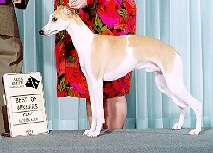 Han also started his Canadian show career with a bang, achieving Winner's Dog his first 5 shows in Canada, but due to low entries it was necessary for him to return again. He was shown a total of 8 times in Canada and was only defeated once. 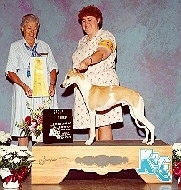 Han finished his Canadian Championship on the 4th of July 1997 with a Best of Breed win and a Group 2 under judge Nigel Aubrey-Jones. He is now long since retired from the ring and lure coursing field and spends the majority of his time lounging on the couch at home. He's a sweet dog and I value his company greatly. Page created byWEBPAGES BY DESIGN, Mary Alderman. 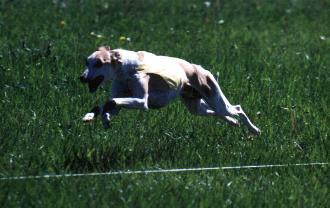 If you like this page and would like one of your own, contact Mary at malderman@jaamawhippets.com . This site, and all By Design Websites are... Proudly FRAMES FREE!!! &COPY All images, page content, and source code is copyright 1998-2004 by Mary Alderman of By Design Enterprises.